It is kind of a habit where I spray perfume on as my daily routine. I do it without thinking everyday, and by everyday I mean yes I wear it without thinking while in uniform. (Is that within regulation?) I am not one for very potent fragrances. I do not want everyone in the room to smell what I am wearing. It is pretty much my personal preference, smell good do good, right?! Also, because my coffee addiction is a real struggle and I drink it throughout the day I try to get a fragrance that will complement that. I have found anything that is acidic does not smell good with coffee. |Pink Chiffon| This story cracks me up. It was not the perfume, but the lotion. I put it on in a room full of guys asked me what that smell was. When I told them it was my lotion, question after question hit, "Is that bath and body works? ", "What is the name of that?" I did not even know that guys knew what bath and body works was. It was hilarious. It smells sweet, but not like a cupcake. I would wear this to work or hanging out on the weekends. |Pink Sugar| This is liquid sugar essentially. It smells so sweet, kind of a cotton candy smell. I love the smell of this, but it might be over the top sweet. I would wear this while doing homework in the library, or hanging out with my sister because it is her favorite sent. |Tory Burch| Okay this is a little bit citrus, but it is also so energizing. If I was going to be public speaking this is what I would wear, so I could be as energized as this perfume. |Laugh with me Lee Lee| Benefit has done it again. Actually this fragrance has been out for a long time. I thought it was discontinued, so I was surprised when I ran into it at ULTA. The packaging makes you want to have a little city apartment and be the next NYC it girl. I would wear this perfume EVERYWHERE. This is my all time favorite scent. It is a little bit more woodsy, but I would say this is what a cloud would smell like in an ideal world. 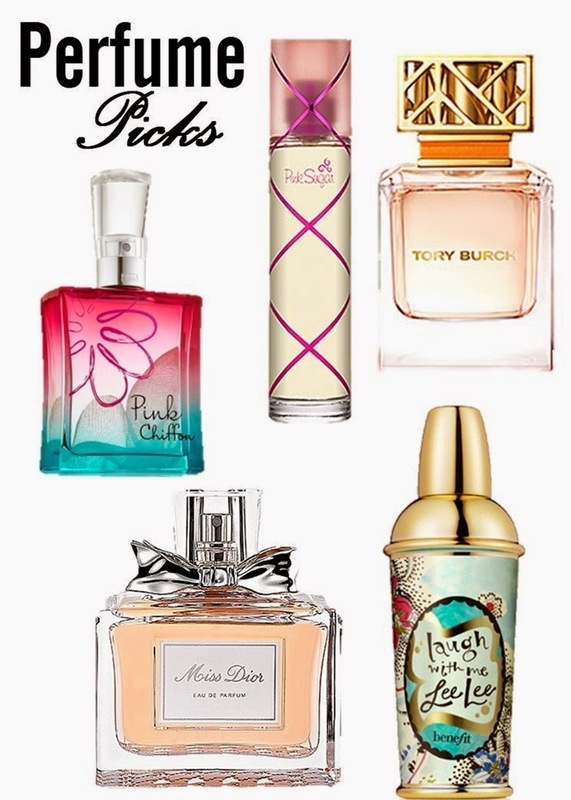 |Miss Dior| This is the only "real" perfume on the list. I feel like everything else is sprays. This is a little more mature for my liking, but I would wear it for a corporate event, or a job interview.